Get in quick! Availability of our Chocolate Mint shake is limited so to ensure you’re not disappointed, visit your Back Office or IsaOrder App today to stock up. This product is not available on Autoship but we’ve made it super easy for you to purchase. To grab this delicious shake, simply head to your Back Office, hover your mouse over the ‘Order’ tab and select ‘Place Order’. Like to get social? 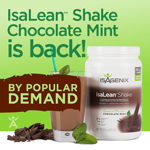 Be sure to tag us on Instagram @IsagenixANZ to show us where you’re enjoying your tasty #ChocMint Isalean Shake.